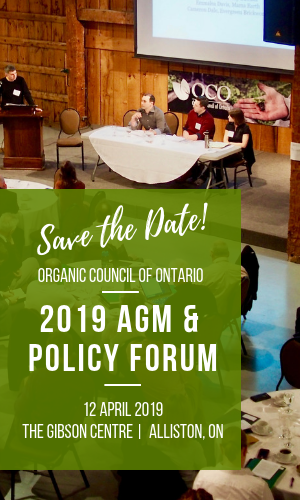 contact our Executive Director, Jodi Koberinski at (519) 827-1221 or jodi@organiccouncil.ca. Your privacy is important to the Organic Council of Ontario (referred to as “we” or “us” in this policy) and the purpose of this policy is to tell you what personal information we collect about you, how we use it, whether we disclose it to anybody else, how long we keep it, and how you can request access to your personal information or obtain more information about the Organic Council of Ontario’s privacy policies. Personal Information: Personal information means any information about you except your name, business title, business address, business e‑mail address, business telephone number or business facsimile number. It also does not include your home address and telephone number if these are published in a telephone or other directory. By default, each member’s business name, city, and province are included in the Directory. Other business or personal details are optional, and may be updated by contacting our office at any time. Members can remove personal information from the Membership Directory or add information by sending a request to OCO. The Directory should not be used for the unsolicited promotion of products and/or services. This policy applies to the “www.organiccouncil.ca” Website maintained by OCO. Our website server tracks web activity during a visitor’s session. This gives us an idea of which parts of our site users are visiting, providing us with information about how the site is of value to our users. Other than in the members-only portions of our website, we do not link activity to anything personally identifiable. This means that a user’s session will be tracked, but the user will be anonymous. Cookies are only set when users visit members-only portions of our website. Your personal information is used by us only for the purposes identified below and access to your personal information is limited to those employees of the Organic Council of Ontario who need to have access to it. The personal information we ask for will depend on which services you may obtain. information with third parties such as other members, affiliated organizations, the providers of products or services relating to your purchase, credit reporting agencies, financial institutions or financing companies,. We may also disclose your personal information where we are required or permitted by law to do so. We retain your personal information as long as necessary to fulfil the purpose for which it was collected. Member records are maintained as long as an individual is an OCO member and for two years following a membership lapse. Purchases and credit card transactions are retained for as long as appropriate to meet contractual, tax, or auditing needs. Directory information will be retained in the directory unless a member updates or requests removal of their information from the directory. If the information relates to a particular service we provide, we retain the personal information for as long as is reasonably necessary to address any issues arising from the service or as may be required by law. If there are legal requirements relating to the period of time which we must retain your personal information, we comply with those requirements. Most of the personal information which we collect is necessary for us to sell or supply to you, to provide products and services, and we cannot do this without that personal information. Similarly, we must disclose your personal information as described above in order to sell or supply you with a product, or to provide programs and services. If you do not want us to use or disclose your personal information in a particular way, please contact our Privacy Coordinator as described above and we will be pleased to discuss with you how we can limit collection, use or disclosure of your personal information. You have a right to access the personal information which we have about you and to request that personal information which you believe to be inaccurate be corrected. If you wish to access your personal information you should contact our Privacy Coordinator who will be pleased to assist you. The Organic Council of Ontario reserves the right to change this policy as required. A revision notice is placed on this policy to indicate the latest date of changes to this policy. last updated November 23rd 2011.